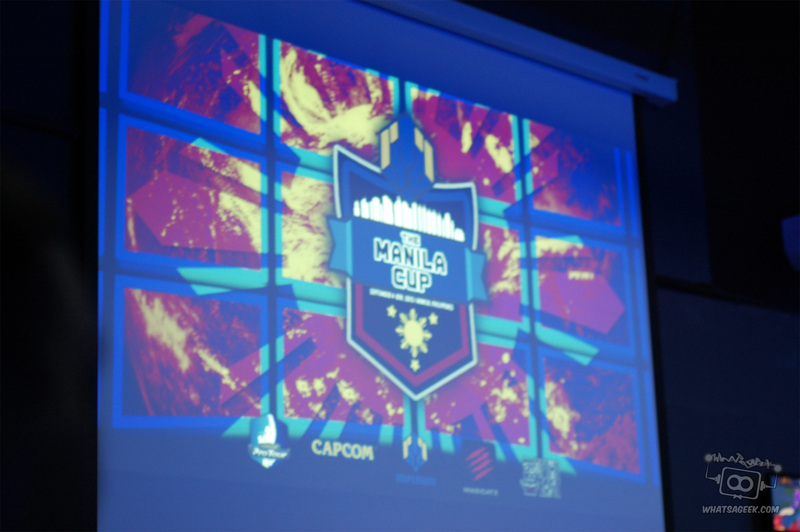 Last week, from the days of September 4-6, the Philippines held one of its biggest fighting game tournaments yet: The Manila Cup. 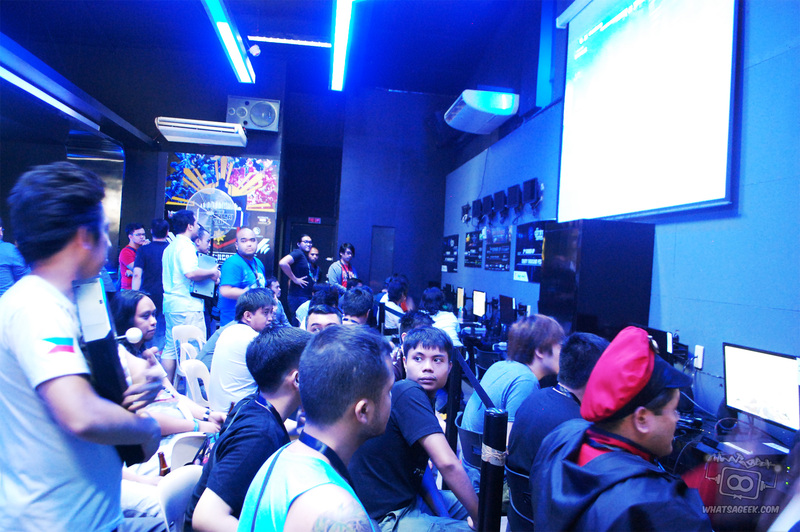 Held in the Imperium E-sports bar in Pasig City Metro Manila, the tournament held competition for six games: Super Smash Brothers 4, Blazblue Chronophantasma Extend, Mortal Kombat X, Ultimate Marvel vs. Capcom, Guilty Gear Xrd Sign, and last but certainly not the least: Ultra Street Fighter 4. The Manila Cup logo up on the big screen! Commenting on the tournament itself, the Manila Cup had a pretty sizable player pool for its attendees. Having roughly over 300 participants in total, the competition was pretty stacked. In fact from those 300, we even saw some pretty notable international players including names such as: ABEGEN (Japan), Taka (Japan), Itabashi Zangief (Japan), Humanbomb (Hong Kong), and Dark Jiewa (China). On that fact alone the competition for each game was fierce. Besides the players, the venue and set-up themselves were notable. Playing and spectating the proceedings of the Manila Cup was comfortable enough, as the size of the bar allowed for a pretty comfortable experience, during the first and third days. Why I note that fact is because the latter half of the 2nd day, when Street Fighter was being played, had the most participants joining (almost 200 players for Street Fighter alone), crowding the venue. Granted this isn’t a knock on the venue itself, but rather a commentary to the country’s Fighting Game Community. What I mean by this is that, these 300 participants for the tournament are just a small measure of the Philippines’s FGC. Hopefully, the next time a tournament of this size and scope gets set-up, more people would join and thus the venue would be somewhere like a convention hall to reflect the community support. Getting back on topic though, the staff also helped in making the attendees more comfortable by offering them refreshments throughout the event; Imperium is a bar after all, and food and drinks were readily available for everyone. The second day very quickly became standing room only, with everyone excited about the action. Moving on to the discussion on the set-up of the Manila Cup. How the tournament was ran, vis-a-vis the “set-up” by which I mean the organization of things such as the quality of the live stream for the tournament and things such as the uniform quality of the monitors for the each of the stations used for each match, was pretty damn great. The live stream was of really great quality for the relative standard of Philippine internet. By that I mean they were streaming on 60 frames per second, which is a really high benchmark of quality for a live-stream. As I said, the monitors used for each station looked uniform and didn’t allow for any foibles via input lag due to the monitor. Add to that they had sticks and pads on stand-bye in case a player would need one for their match. Oh, and I almost forgot to mention, they were also putting up the stream on a TV outside the bar, for participants staying outside (which personally benefited us during the crowded Street Fighter pools). My own personal observation on how the tournament was run was an issue I saw with how the Blazblue stations were set-up. My issue being that 3 of the 4 stations were being played on PS3s, the fourth however was being played on the PS4. For a tournament this is…odd to say the least, because uniformity is important. It could be possible that a competitor’s stick or pad isn’t compatible on the PS3 or PS4, and if he were to land on a station that didn’t support his preferred control method, then he’d be put in an automatic disadvantage. But yeah, that’s pretty much my only gripe about the tournament (and my wish for a bigger venue like a convention center). People warming up for matches, side events, and the main event on the big screen. We also caught-up with Raphael Gancayco (the owner of Imperium and the tournament organizer), and asked him a few questions about the tournament. It turns out that he hosts similar tournaments on a regular basis, however Manila Cup is the biggest tournament that Imperium has hosted yet. A cool fact would be that it was Capcom that approached them to be an event that would be part of the Capcom Pro Tour, being an event that would allow competitors to amass points for the tour. Finally being the cool guy that he is, it was Raphael and Imperium themselves that provided the prize pool for the tournament winners (and of course part of the entrance fee would be added to the prize pools). Of course, we asked Raphael: What’s a Geek? 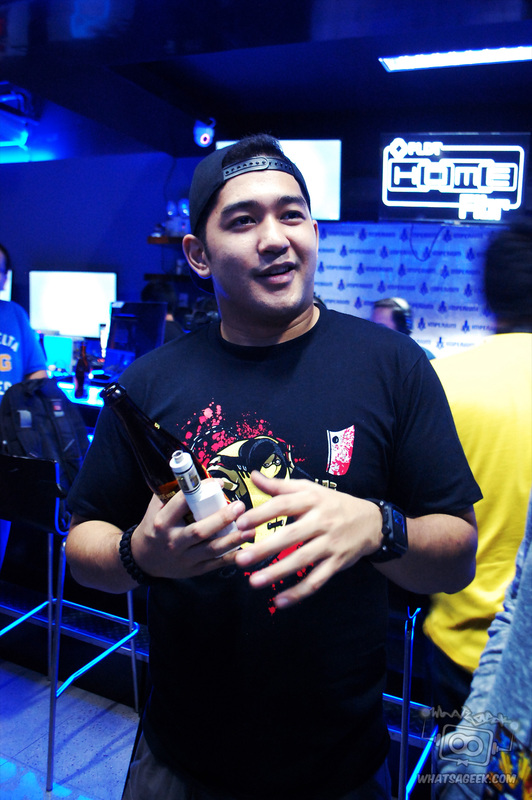 Imperium owner and tournament organizer, Raphael Gancayco. 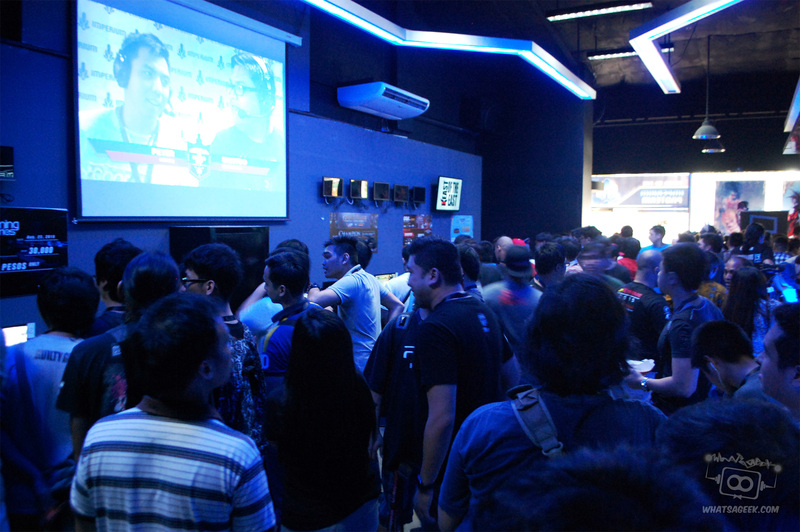 Imperium e-Sports bar and Video Game Lounge, home of the Imperium Pro Team is located at unit 6B, 2nd floor of the Metrowalk Commercial Complex on Meralco Ave.
Full list of the Manila Cup results can be viewed here. Orange and Leandro would have competed but are, unfortunately, filthy casuals. Smash on the big screen! Casters for the Smash tourney. GG on the big screen! WaG’s own ShinHobo on the left, with some MKX. Organizers and participants alike double-checking the brackets. Sub-Zero in the caster box for MKX! Jeriel Martinez as Bison and Carl Jimenez as Sub-Zero! WaG’s Khrysler Jericho also tried his hand at Street Fighter on day2! Cosplayer Anicka Lyka Yu dropped by as Juri! For these players, it was another day of competing at Street Fighter; for Bison in the commentary box, it was only a Sunday. Red Bull girls helping out the gamers! USFIV Winner Tonpy, with Imperium’s Raphael Gancayco and placer Humanbomb on the right.